What do major league baseball player Andrew “Chipper” Jones and Advanced Energy’s Xstream Remote Plasma Source have in common? They’re both great switch-hitters. Jones is considered one of the best ever, batting .304 from the left and right side of the plate; Xstream is a dual-purpose RPS, equally capable in deposition and thin film etching as well as chamber cleaning, only with a batting average much higher than Jones. We are as obsessive about versatility and measuring performance as baseball fanatics. Let’s start with power. Xstream is offered in 8 kW and 10 kW models, with a 225 kHz to 660 kHz operating frequency and our patented active matching network™, which ensures that the output impedance of the power supply aligns with the impedance of the plasma. Xstream also features pulsed power for ignition and a transformer induced power delivery system during operation. That decreases unwanted sputtering and eliminates ignition failure, so Xstream bats 1,000 when it comes to starting and maintaining operation during semiconductor manufacturing or plasma chamber cleaning. 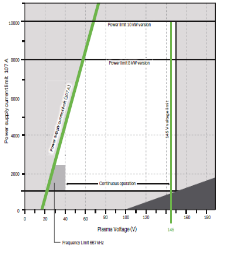 You might have seen a whitepaper we recently released, titled “Advanced Ignition of Remote Plasma Sources Using Pulsed Ignition and Power Load Distribution with Multiple Igniters,” that goes into depth on the engineering and testing behind our technology, which you can download here. Xstream has a cooling mechanism that allows the inner surface of the chamber to remain below 90°C (194°F) even at cooling water input temperature of 35°C (95°F). We also use a proprietary high-purity aluminum alloy that creates a very dense and uniform anodization layer protecting the chamber from the internal gasses used during fabrication. As we developed Xstream, we made sure that it not only was a dual-purpose RPS, but that it helped increase the lifespan of the chamber. 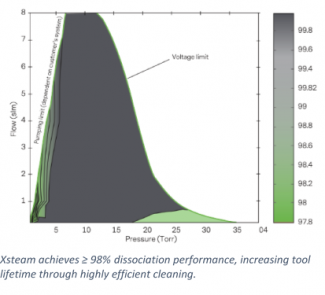 Xstream’s NF3 dissociation performance, ≥ 98%, improves chamber cleaning time and reduces NF3 consumption. For our semiconductor customers, integrating a remote plasma source that can precisely control deposition and thin-film etching as well as chamber cleaning into their process pays off in improved throughput in addition to lower total cost of ownership. Looking at the TCO from a high level, the advantages include application flexibility and extended chamber lifetime. Process performance is increased, and thanks to the solid-state active matching network you can use Xstream with a range of chemistries. The cooling system is designed to reduce water consumption, one more way we help you optimize process resources. Considering that a semiconductor manufacturing facility uses two to four million gallons of ultra-pure water per day, any reduction translates into cost savings for the water, reduces wastewater treatment and supports enterprise responsibility around sustainability. Next time you are scouting for a key contributor to your semiconductor fab process, take a look at Xstream. Not only is the Xstream platform a league leading RPS, it cleans up plasma chambers with MVP level performance.